The summit of Haleakala, which means “house of the sun,” is a popular spot for visitors and residents alike, especially at sunrise. 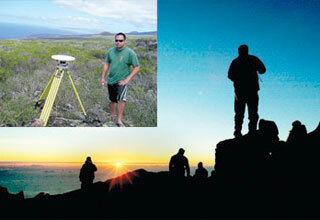 Inset, Hawaiian Volcano Observatory worker Kevan Kamibayashi monitors satellite-linked surveying equipment that measures volcanic activity on Haleakala. To his right is one of the latest lava flows that occurred about 500 years ago.